It’s a clean break between Mt. Laurel Township and former township manager/tax collector Maureen Mitchell. At council’s Aug. 15 meeting, council approved a resolution authorizing a settlement agreement, general release and waiver of claims regarding Mitchell and her former positions with the township. The resolution was the first public action from the township regarding Mitchell in the nearly seven weeks since council’s June 27 meeting where it first passed a resolution authorizing the removal of Mitchell from her duties. The township first hired Mitchell in 2012. Although the original resolution passed at the June 27 meeting specifically authorized the “removal” of Mitchell, township solicitor Tyler Prime said the separation is now a “resignation/voluntary leaving” as a result of a settlement reached between the parties. Prime describes Mitchell’s departure as an “amicable agreement” to separate. “The Township is pleased with the terms of separation from Ms. Mitchell. This allows both parties a clean break,” Prime said. Per state law, that means Mitchell is entitled to any unpaid balance of her salary, together with her salary for the three calendar months following her departure. Although council did not publicly comment on Mitchell’s departure at the Aug. 15 meeting, Prime echoed council’s previous sentiments in comments made later to The Sun. “Township council aspires to employ the absolute best people to run the many departments of the township and this is in the furtherance of that goal,” Prime said. At the Aug. 15 meeting, councilmembers Irwin Edelson, Richard Van Noord and Dennis Riley each voted in favor of Mitchell’s resignation and settlement agreement, with councilmember Jim Keenan voting against. Mayor Linda Bobo was not present. Mitchell could not be reached for comment. For now township clerk Meredith Tomczyk continues to serve as interim, acting township manager. — Council passed a corrective action plan related to findings of the recently approved 2015 township audit. One finding related to an operating deficit in the Paws Farm Nature Center reserve fund of $4,142. As trust funds are meant to be self sustaining, the township plans to remedy the action by examining the fees currently being charged at Paws Farm as well as looking into the possibility of corporate sponsorship. — Council approved a bid from R. Maxwell Construction Inc. in the amount $334,850 for the construction of a new concession and restroom facility to be built at Memorial Field, adjacent to the existing turf athletic field and parking area. — The next meeting of the Mt. 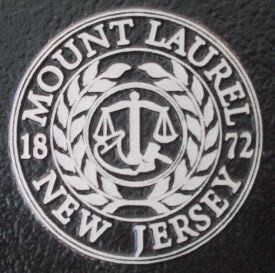 Laurel Township Council is scheduled for Sept. 12 at 7 p.m.